Cesar Milan's Illusion Collar...has any Chow owners try this type of collar?! My lady dog's leather collar is wearing down since she pulls when she is near grass so I am looking for a great...or near...collar. Let us know, thanks! 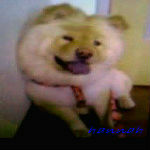 I use a harness to keep my Chows from escaping and a collar for their vaccination and identification tags. Dog obedience trainers do not like harnesses since they say you have less control over your pet with them. 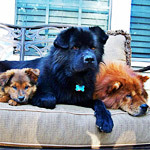 Chows control themselves for the most part and will train their owners to let them know that. I don't like the illusion collar at all. 1) it looks stupid 2) it's so much on the dog's neck and 3) I've heard they fall apart really quickly. I always used a harness on my chow girl Tippsy. I still use harnesses with my 3 dogs now. I also really like martingale style collars. That's the only style of collar I will attach a leash to because sized right, they can't slip out of it if they try since it tightens. I cant see it working for a chows body shape. I don't bother with collars at all (apart from Fozzchops has a sparkly one for going to parties ). My two wear rolled nylon collars with leather peices on the end so they can't tighten if they get caught on something, (a bit hard since the ends are hidden by their fur) these hold their id and rabies tags and they wear them 24/7/365. For walks they wear "easy walk" harnesses. They work really well and fit nicely. The only issue I have with them is that they can cause the fur/hair under the front legs to mat easily. Firesong has very soft silky hair and the harness can cause mats if I'm not careful. I believe I have tried all the collars so let me tell you what works best. I purchased Cesar's collar and it was OK, I just felt it was difficult to get on and off. I tried the martingale from one of the members suggestions on this site. I wound up chasing her down the street with the collar in my hand along with the leash. It has to be adjusted putting it on and readjusted to get it off. A real PIA. We all know the choke collar is not for our dogs because of the breakage of hair around the neck. I only use a harness when we go for strolls where she is allowed to sniff and stop wherever she wants and that is usually at our state park. When we go on a serious everyday walk I have found the British style Mendota lead to be the very best, it is the leash and collar all continuous of the same material. It is a loop made of a very strong material that can be adjusted to a snug fit around her neck, easy on and easy off. Comfortable around your wrist and to hold onto. No breakage of hair and I can control her. I believe I may have mentioned the martingale collar to Michael and I think there must be different types because this one does not need to be resized everytime you take it on and off and it has a snap you just unsnap it to take it off and snap it on to put it on..I agree if I had to resize it everytime I would not have bothered .. 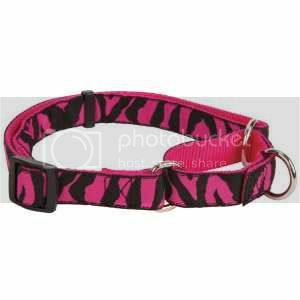 This stays one size unless your dog grows then you can resize it like any collar. I must say it worked fine with my dogs but it might not work for all. I just wanted to clear up the type of collar I suggested was like in the picture. No fooling around with resizing each time . We're in the same boat ... looking for a collar that is effective for training. I tried the chain collar because they're been effective on my previous dogs but holy moly! do they eat the hair on chows' necks, you're right! My trainer recommended fur saver chain collars (like these http://leerburg.com/fursaver.htm) ... has anyone ever used these? 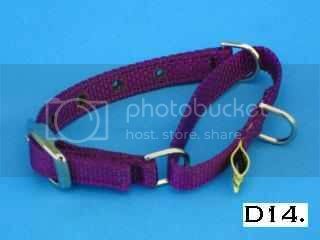 This is the martingale that Dixie has. I chose this over the ones with the quick release buckle because she's broken so many quick releases. I don't mind having to adjust it a little everytime I put it on and take it off. Knowing she's secure and can't get loose makes it worth it. This is another style that I've found online. Thank you for all your inputs! I guess I will try out what the majority of yous said, thanks again! I use a harness with a flap on the back when I can pick him up like a suitcase. It has been very useful since I can use it to tie seat belt and he always resist when we are on driveway to come back in. The brand is Kong and i have 2 colors red / blue Medium size it fit him since 3months till ~2years. I use a harness, too. It's great for control. She also has a regular collar with her name and number on it. 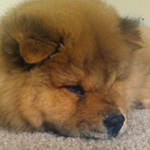 ChowpupS I would like to know if the "martingale" collar you recommended kills the fur on your chows? Thats if you have a rough coat chow that is. I've used one on Achilles before when he was younger but switched. And now that all (most) his fur is here I would like to put one to good use again. And Kimbe the "fur savor" collar from the link is the same concept as the coke collar and will give you the same results. The collar was fine with my rough chows fur you can see in the banner photo she had a pretty thick mane and the collar is actually on her in the photo to the right . The links are large and smooth and Iam using the same collar on my golden retriever now and her fur is much softer around her neck and no problem , hope that helps. Definitely read how they should fit and the right thickness! I too use a step in harness. I find collars pull on the wind pipe though I've never tried the martingale collar. I attach the dog tweeter to the leash for correction. I've been using it for about 2 years now and she responds well to it. I use a plain jane 1" webbed nylon collar with a metal buckle. I take her collar off often in the house, and my Minnie was not crated while wearing her collar. I haven't had any issues. I use a regular collar with all my pup identification and shots, but do not walk him in it. I use a harness from petsmart that I got called the easy walk harness, which has something similar to the martingale. It really works well. I went to the shop to get it after being skeptical about the whole thing. You would be surprise right as I put it on my pup. He stopped pulling!!! For the past 2 months of having him and going on walks. He would pull to a point where he would seem like he is choking himself. Now that he is wearing this harness. He just stopped pulling and everytime he gets far ahead. He would stop and turn around making sure I was there! It is great because whenever I stop and he walks. He would stop as soon as he reaches tension in the harness. Definitely a miracle. We just got this same harness(easy walk harness) for our golden retriever, our dog sitter(walker) recommended this when I said I might need knee surgery and had concerns of her pulling . we too put the harness on her in the store and it was immediate the change in her walking, she gave us her attention and waited for commands amazing difference . I would say a harness is better because it causes less damage to the throat and doesn't cut off air.